Members of the Northern Charity Fundraiser and children living at the Dr Frans Aupa Indongo Care Centre pose for a photo. 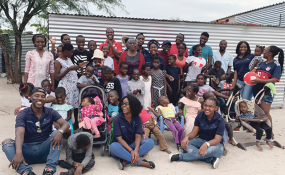 A charity fundraiser in northern Namibia has partnered with an orphanage care centre to bring renewed hope to the once impoverished and destitute children of Okandjengedi and surrounding areas. BEHIND the gates of an orphanage at the edge of an informal settlement at Okandjengedi, Oshakati, more than 40 children are being given plates of rice and potato stew in a blue and white tent. The aroma of the food brings joy to the little faces. The children line up to be served. One sits in a wheelchair. Two others sit in baby cots which were turned into wheelchairs, while two more are secured in sitting positions in their chairs in order to "strengthen their legs and teach them how to sit", says their caretaker, Aili Shilongo. Shilongo is the founder of the place where the children live - the Dr Frans Aupa Indongo Care Centre. It shelters children living with disabilities, and has been running for 17 years. Although the centre is registered with the health ministry, it does not get help from the government, and survives on handouts from good Samaritans and contributions from parents of the children living here. On 26 January 2019, members of the Northern Charity Fundraiser visited the centre to present donations. This is the second time I visited the centre. On my first visit, the picture was not as nice. Michael Erickson, co-founder of the fundraiser, has little patience with the fuss made of his pioneering charity group, which he hopes will help improve the living conditions of thousands of Namibia's poor. This charity initiative, Erickson says, aims to improve the lives of the less fortunate children and vulnerable families residing in the Oshana, Omusati, Oshikoto and Ohangwena regions. It started in September last year when the Northern Charity Fundraiser hosted a fun day at the Oshakati Stadium. The event featured various sports codes: seven-a-side soccer, netball, volleyball, chess, owela and playing jack, while corporate and social teams partook. The northern parts of Namibia, though densely populated, have only a few shelters, orphanages and places where the less fortunate can get assistance. This is what prompted Erickson and others to come together and raise funds. The fundraising initiative is made up of young men and women with the hope of giving back to the communities in which they live. "It is very rare to find young people involved in voluntary work. Most of them just want to drink and waste their money. May God bless them (organisers) and give them more strength," Shilongo told The Namibian. Shilongo says she could send the children back to their houses, but this means they may be at risk of being neglected if they remain in their communities. On paper, children with disabilities are legally entitled to attend "ordinary" schools with their peers but, in reality, very few do so. In 2016, the Namibia Statistics Agency released a report stating that the number of children with disabilities aged zero to four years who were not attending an Early Childhood Development (ECD) programme had increased from 3 359 in 2001 to 5 135 in 2011. Moreover, 28,9% of children with disabilities, who are five years and older, had never attended school. The highest proportion of persons with disabilities with no formal education are those living with blindness and visual impairments. At the centre, they are offered basic education. But some of the children need extra care. They are unable to feed themselves. They remain restrained in chairs, and have to reach out to their caregivers to be spoon-fed. But today, the caregivers can breathe a sigh of relief as members of the Northern Charity Fundraiser take over that role. Shilongo watches as the children sang, danced, and were fed to their hearts' delight. The charity group also explored the children's creativity. "It is uplifting. Some of them, in the beginning, would not touch a brush, pencil or paint. They adamantly refused," Shilongo says. But today, they draw each other's faces. And better still, they do not want to stop the exercise, which brings out new joy. Erickson says Namibia's human resources are the most valuable asset the nation has. "We believe in investing in our children, who are our greatest asset. As we grow in future, we hope to reach more people (who are) in need in the entire northern regions," For now, the charity organisation is not registered, but there are plans for it to become a fully registered non-profit organisation. "Churches and the community do what they can, but they only reach a small percentage of those in need. A large number of primary school children miss school because of hunger, although the government has feeding programmes. "Children are missing school because they do not have uniforms, and the caretakers cannot afford to buy them uniforms," Erickson says, adding that they have identified schools, families and community projects that help the less fortunate who can benefit from the funds raised. The foundation's mission is to address problems related to hunger, poverty and education by identifying less fortunate and vulnerable children in the four regions, and by coming up with solutions to minimise dependency on charity. The children were also showered with gifts and a feast of great music. The Northern Charity Fundraiser 2019 will be held in July. As we say our goodbyes... I watch as Shilongo looks at her children with respect and understanding. The faint voice is being heard - and that brings peace to hearts, and I believe, the nation.